Romford station maintains its air of a busy mainline station even if the express trains no longer stop there. It's situated on the eastern outskirts of London and does a good trade in commuter traffic from its four mainline platforms, plus Platform 1 for the Upminster train, situated on the south side of the station, hidden away along a passage way. It's surprising that this branch is still in business, with just the one station between the two termini. The train has just a handful of passengers on it as it leave the mainline to go onto the single track Apart from some early greenery its mainly housing on both sides of the track, as the train chunters along at a steady 30 mph. The one and only stop on this line is at Emerson Park, which has two platforms. The station building is all boarded up and painted maroon. After Emerson Park the houses disappear to thick bushes by the side of the line until we reach the junction of the Southend Central line. 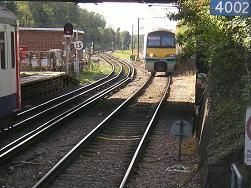 There's also the District Underground line here so the cutting is quite wide as we slip into the northern platform at Upminster station, hidden form the Southend lines by underground trains.